Simplicity did the trick here. Is the fruit of the Mexican plum edible? If so, delicious? Agreed: an excellent site it is. Observations on geometry are always welcome here. Beautiful, delicate, and calm — lovely photograph, Steve. I’m happy to hear you felt a sense of calm, especially as this plum tree grows at the edge of a main street within sight and sound of a freeway a block away. Thanks. You have the right name for this picture. Great picture – I can practically smell them! Someone else commented about the scent but unfortunately with so few early blossoms I didn’t smell anything. I’ll see what comes my way later in the season. They’re beautiful little blossoms, and I’d like to try the fruit sometime. I did look at the link you posted for M.S.Wills, and saw that the flavor varies greatly, but as a rule, I really like plums. Someone else mentioned the smell, which unfortunately wasn’t strong enough for me to detect, given how few blossoms had opened. If I come across any of the fruit later in the season, I’ll try it to see how it tastes. Between Spicewood Springs Road and McKinney Falls, you’ve found some beautiful examples of this tree. While I enjoyed looking back at your photos of the trees in full bloom, this is a fine complement. I like its simplicity. 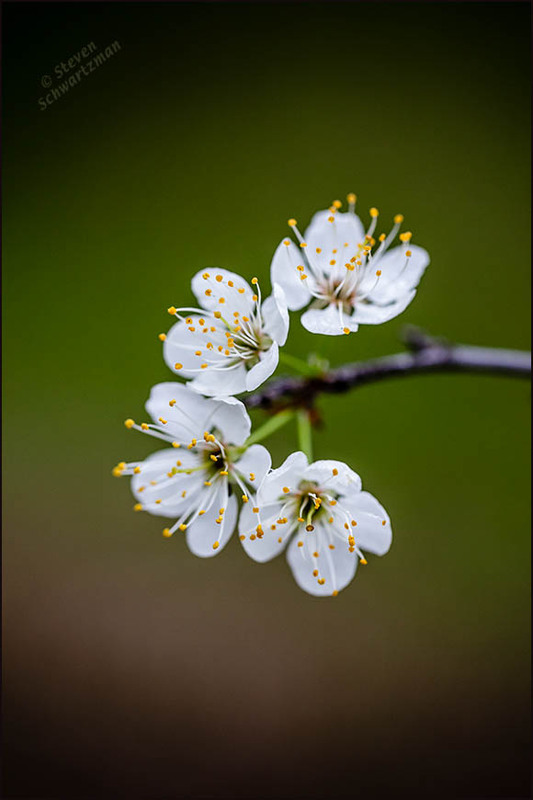 Somehow, I’d never gotten around to identifying a tree I found in bloom on the Willow City Loop, but when I looked at the photos just now, it’s clearly Mexican plum. On that trip, the redbuds were in full bloom, too. I was there on March 22, so it’s getting time to be making the trek again. You’re reading my mind again. I looked back at posts showing Mexican plum trees covered with lots of blossoms, thinking I might include a link in case anyone wanted to see the later stage. Then I decided to wait and see whether I find any fully flowering plum trees later in the season that I can make new pictures of—just as this post’s minimalist image of just a few flowers was something new. Beautiful photo! From here it’s hard to imagine spring blossoms already. I spent most of the day plowing snow. Yes, plowing snow is an alien pastime here. And yet I remember how early in the year you’ve sometimes shown new wildflowers you found up there, even when snow was still heavily around. The resemblance isn’t just coincidental: pears and plums are both members of the rose family. WHOA! A new one for me. I am already baffled by the different species that are known as ‘American plum’. I do not know the Mexican plum. Goodness! That is a big range! It is something that I should have been familiar with. The American plum that is common here is naturalized from understock of the old orchard trees, but is actually not native. It is a rather nice plum, but made me more interested in the other North American species that are related to it. They can be difficult to distinguish. One good thing is that you can see Mexican plum trees when you finally return to Oklahoma. I have plenty of trouble distinguishing species. A documentary about Australia’s Great Barrier Reef that we watched yesterday said 2000 species of sponges live there. At least the sponges in my kitchen come in distinctive colors. Those documentaries never show where the rectangular sponges grow. Lovely shot. Has it gotten nicer? I’ve been reading how so much of the country is getting pounded by this series of storms, with even snow falling where it usually doesn’t. My friend Joyce and I are getting stir-crazy, not being able to get out into the preserves. Sheets of uneven ice everywhere, and the temps stubbornly staying cold. I’m sorry about your stir-craziness and cold and ice, and also sorry to say that’s not unusual for February in northern Illinois. Down here it’s 73° now with a mostly sunny sky. That’s why I moved south. As for the plum tree, I haven’t been back by there, so I don’t know how the blossoming has progressed. I assume, based on past years, that a lot more flowers have come out. I hope so. I’ve been busy though. I had a show end, and another is about to start. That means lots of carrying paintings around. I’m grateful for the opportunities! Glad to hear about the opportunities. Hope you made and make a good showing. Thank you Steve. Opportunities are wonderful things when they come along.